Recounts of two key US midterm elections began in Florida yesterday amid accusations of fraud by both sides in the race for governor and a Senate seat. Exhausted election office employees were told they have until Thursday to tally up votes cast in last Tuesday's election yet again. Unofficial results from Saturday showed Republican Rick Scott's lead in the Senate race had narrowed to 12,600 ahead of Bill Nelson, the Democrat incumbent. Meanwhile, Andrew Gillum, a Democrat vying to become Florida's first black governor, retracted an earlier concession after the count narrowed to put him within 33,600 votes of Ron DeSantis, the Republican candidate. Both counts were hit by the slow postal vote counts that put the candidates within a margin of error that triggered a machine recount. Accusations of fraud and threats of lawsuits from both sides conjured up memories of the state's controversial recount during the 2000 presidential election. The Florida secretary of state ordered the recounts, an unprecedented step for the two flagship races in a state that took five weeks to decide the 2000 poll. Secretary of State Ken Detzner's office said it was unaware of any other time either a race for governor or US Senate in Florida required a recount, let alone both in the same election. 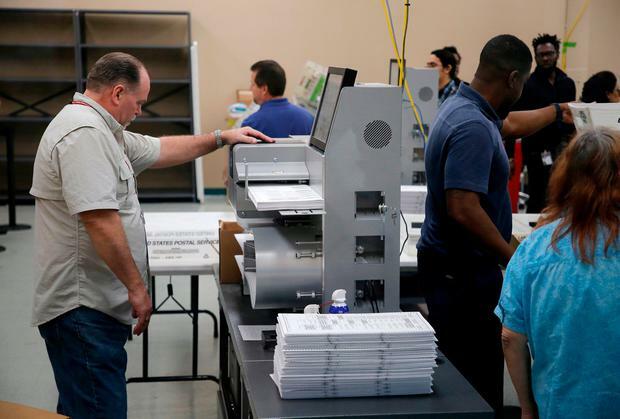 The recount ran into early problems in Broward County yesterday, when a voting machine failed to register all ballots and Republicans asked for all machines to be tested. The count got under way after a two-hour delay. The heavily Democratic county is one of two where Republicans have made allegations of possible ballot fraud. Miami-Dade County election officials began feeding ballots into scanning machines on Saturday evening. The tedious work in that one South Florida county alone could take days, considering some 800,000 ballots were cast. Multiply that by 67 counties in the nation's third-most populous state, and the scope of the task was beginning to sink in yesterday. Mr Scott claimed yesterday that Mr Nelson wants fraudulent ballots and those cast by non-citizens to count, pointing to Mr Nelson's lawyers objecting to one provisional ballot being rejected in Palm Beach County because it was cast by a non-citizen. "He is trying to commit fraud to win this election," Mr Scott said. "Bill Nelson's a sore loser. He's been in politics way too long." Both the state elections division, which Mr Scott runs, and the Florida Department of Law Enforcement have said they have found no evidence of voter fraud. The recount opens against a backdrop of political tensions. US President Donald Trump on Saturday tweeted without evidence that the elections were being stolen.